“Today is the beginning of a new chapter in our lives. More difficult, more painful, less joyful, less full of love. I and Jo’s friends and family are going to work every moment of our lives to love and nurture our kids and to fight against the hate that killed Jo. Jo believed in a better world and she fought for it everyday of her life with an energy, and a zest for life that would exhaust most people. She would have wanted two things above all else to happen now, one that our precious children are bathed in love and two, that we all unite to fight against the hatred that killed her.” Brendan Cox, husband of murdered MP Jo Cox. It was so heart breaking. After 30 minutes I switched of PM, the BBC Radio Four news programme. I couldn’t bear the sorrow and the evil of what had happened. A Member of Parliament killed in the street as she went about her duties. I know that almost everyone who dies in such circumstances is hailed as a heroine and saint, but Jo Cox really seems to have deserved all the praise she will now get. A local Yorkshire lass, mother and a dedicated MP who exemplified all that is good about public service. She is not the first, and sadly will probably not be the last MP, to have been killed in the course of their duties – most by the IRA. Sir Richard Christopher Sharples, 1973. Mrs Joanne (Jo) Cox, 2016. The man who is accused of killing the latest victim is a 52-year-old Scot, a loner with a history of mental illness who is alleged to have subscribed on the Internet to a right wing South African pro-Apartheid group and an American Nazi group. Some reports say that the MP intervened in an altercation, others that the assailant cried out “Britain First’ as he shot her. Britain First is the name of an extremist right wing group who immediately disavowed any responsibility. I had a gut feeling when I switched off that this would be used in the EU referendum debate. One does not have to be a devotee of House of Cards to know that there would immediately be people thinking on the one hand ‘how do we use this?” and on the other ‘how do we stop this being used?” Fans of The Good Wife can imagine Eli Gold spinning from the beginning. What I did not expect was that life would imitate art so quickly. Within a couple of hours the ‘campaign’ was in full swing (whilst of course people were announcing that they were suspending campaigning). With the blood not yet dry on the pavement the Guardian could not resist making political hay out of this tragedy. They labelled it an ‘attack on humanity, idealism and democracy”. Polly Toynbee wrote an article headlined “the mood is ugly and an MP is dead” in which she managed to link Michael Gove, Boris Johnson, Enoch Powell, Sir Oswald Moseley and Hitler – that was a new low even by her standards. An SNP MSP retweeted that ‘it was a political assassination”. Even Alex Massie in The Spectator could not resist the temptation. In a superbly written article he managed to blame the killing on the Brexit campaign, whilst saying he was not doing so. Why is this so wrong? Because it is crass cynical manipulation and exploitation of a dreadful tragedy for personal political ends. It is as gross and wrong as Donald Trump’s misuse of the Orlando massacre to justify his own extremist anti-Muslim rhetoric. In both these instances there is one common factor – mental illness. Jo Cox’s killer was mentally ill. His mixed race brother said that he had never expressed any political or racial feelings. The fact that he linked to extremist Nazi sites on the Internet is relevant only in so far as that was apparently what he used. He was also obsessed with books and gardening. And he was a Scot. Should Scots, book lovers or gardeners be held partly responsible? Of course the suggestion is ridiculous, but is it any more ridiculous than blaming her tragic death on the referendum? It would not be the first time in history that the actions of a mentally ill person were used for political ends. The Guardian in self-righteous mode is a fearsome sight, and Polly Toynbee especially really knows how to combine virtue signalling, with moral certainty, guilt inducement and political condemnation. The Guardian’s hastily rushed out coverage was on a level of the Sun’s horrendous coverage of Liverpool fans after the Hillsborough disaster. But it was a surprise that The Spectator allowed such a crass and manipulative piece of journalism. It is absolutely correct that some of those on the Leave side have raised up the temperature and used intemperate language. 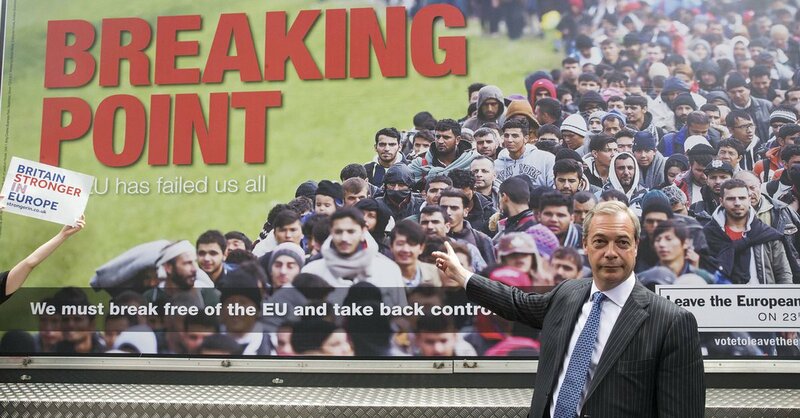 Nigel Farage’s latest poster showing Syrian refugees was one of the sickest things I have seen. For me it is a major priority that we should seek to help refugees – not demonise them. But…and this is a massive but….both Toynbee and Massie are missing out a crucial part of the equation and they are being supremely hypocritical. What they say about intemperate language and stirring up hatred against opponents is undoubtedly true, but it is true of both sides. When the Remain side warn us about WW3, financial collapse, ISIS supporting Brexit etc. and then damn all those who think Britain should be out of the EU as ‘Little Englanders’ only one step removed from Fascists, what do you think they are doing? Stirring up love, peace and understanding? or fear, contempt and loathing? During the Scottish Referendum there was a nasty tone (actually much nastier than I have so far observed in this EU referendum) and the SNP were accused of exactly the same thing. Project Fear attempted to link the independence cause with all kinds of nasty nationalisms all over the world, and the over zealous and to be quite frank, disgusting antics of some SNP supporters were used to great effect by their enemies. I defended the majority of the SNP then and so I am disturbed to see that Nicola Sturgeon has been using the same tactics, warning of a right wing Tory takeover. Jim Sillars, a great admirer of Sturgeon, called it ‘the whiplash of fear’. He was right. No arguments. No facts. Nothing positive. Just disgust, contempt and hatred. So please Polly and Alex, spare us the self-righteous moralistic outrage – when you do the very thing that you condemn others for doing. You encourage rage, you stir up savagery and hatred against opponents”. The equation you hint at, and sometimes explicitly make, is this – that vote Leave is based on immigration, that there are people who are opposed to immigration who make racist comments, that these racist comments lead to hatred, that hatred leads to violence – therefore that those who support the idea of Britain leaving the EU are contributing factors in the death of Jo Cox. This is for real. Again only yesterday I was accused of being a Farage supporting racist because I think that Britain is better off out of the EU. There were no ‘ifs’, no ‘buts’…that is just the way it is. And that was before the murder became know. At a personal level I have become used to this type of rhetoric. Apparently I am a supporter of homophobic murder, catholic atrocities, nationalist vendettas and now racist violence. One of the big troubles here is the Internet. It allows people to engage in confirmation bias, name call, mock and to refuse to engage in any meaningful sense with those who disagree with them. Answer one point and they Google another article that shows they were right all along (which will be ‘liked’ by their ‘friends’). Suddenly everyone is an expert in everything. But it also allows all kinds of conspiracy theories, hate speech and does so within the context where the keyboard warriors can stir up emotion, as easily as an emoticon can be displayed. The Internet encourages and thrives on this narrative. All of us can be shock jocks now. Politicians and journalists know this. They can speak in code and be very careful with their language, but they know that it will be picked up, amplified and passed as a meme through social media and blogs. The coverage so far on mainstream media has been quite measured and careful, but that on social media and some talk radio has been totally disgusting. In the context of a broken society this is leading to an increasing use of abusive language, hate speech and frustration, in real as well as virtual life. And that will inevitably affect our politicians. A study in the Journal of Forensic Psychiatry and Psychology in January 2016 examined the “harassment and stalking” of MPs, and made some startling conclusions. Of 239 Westminster MPs who took part: • 81% had experienced intrusive or aggressive behaviour. • 18% had been subject to attack, or attempted attack. • 53% had been stalked or harassed. If you are in public service that is what will happen to you. If you have a public voice at all it won’t be long before you get the most vile abuse, campaigns against you and even death threats. And the worrying thing is that people get so absorbed in their opinions that they forget the people who are on the receiving end of them. You get used to it and just shrug your shoulders and say ‘that’s the internet’. But combine it with mental illness and it can become dangerous. Speaking of mental illness what bothers me is that it is not really taken seriously enough. And such is the confusion within society that people don’t often understand what it is. One key lesson is that we need to resource more those who work on this most important frontier of society. But there is another trivialisation of this subject that occurs. Again on the Internet, people are so certain, so know-it-all, so righteous, that anyone who disagrees with them MUST be mentally ill. Several times I have been the subject of threads on militant secular websites that have postulated about my mental health and how I was mentally ill and a danger! But it gets worse. One newspaper editor tweeted “I’m sick of humanity”. A sentiment that will be shared by many people. I can understand it. But we have to be careful here. Such a sentiment can all too easily mean I’m sick of other human beings. Not me. Not my tribe. We are for peace, love and understanding. It’s the other lot. It’s always the ‘them’. The ‘us’ are fine. My observation is that it is often the case that the more people talk about peace, love and understanding, the less you are likely to see it. I think I have received more hate mail from people in the name of ‘love’, than I have from any other group! I was lying in bed last night, unable to sleep, thinking about all of this…. in a degree of darkness and despair that I have not known for some time. I kept thinking of Jo Cox’s children and husband, and of the many other people who are victims of mans inhumanity to man. When will it ever end? How long, O Lord, how long? What about the Christian response? As I reflected on this it did not really help. To be honest we are no better. I knew that when I got up, there would be Christians who would have reposted the Spectator and Guardian articles, yes because they cared, but also because it fitted their political argument, which they support in almost the same way as they would a football team. (Although I have to say in fairness that at least a couple having thought about this removed their posts). Some of us, and I include myself in this, can become as obsessed with politics as others are with sport. And we can take it all so personally. I think sometimes though, that of all the hypocrisies, Christian hypocrisy is the worst. We tell ourselves, we don’t do that…we are for peace, love and understanding…its not politics. And yet think about what that means in this sin fractured world. We tell ourselves that we post an article, not because we are seeking to make a political point, or because we are virtue signalling, but just because as Christians we really do care about peace, love and understanding in the world. But if that is true why is it that we only post these articles that can be perceived to support our political position? Are we really saying it has nothing to do with our politics and is only out of the purest motives? You do realise where that leads us? That those who did not post really don’t have good motives and don’t really care about peace, love and understanding…and so the tribalism continues, and the self-righteousness is fed like a never to be satisfied monster. How do we do this fight against hatred, without being swallowed up by the hatred? How do we fight the good fight? Is there no hope? I would suggest that there is great hope – and it comes from grasping these great teachings of Jesus Christ. Get your theology right and the rest will follow! 1) Total Depravity – Great hope? You’re kidding! I understand the incredulity. In the midst of an Internet discussion on the EU referendum I explained that my view was that whether we were in or out would not make a massive difference. “In or out we are screwed anyway”. To which the response was – “Well, with that attitude, I’m sure we are.” You see the non-believer has to put their faith in themselves, or humanity, or society. The trouble is that these will always fail us. Yet we still get shocked when that failure happens. We have the illusion that human beings are basically good, and therefore seek someone to blame when we find that that is not the case. The doctrine of total depravity does not mean that human beings are as depraved as they could be; it does mean that every part of our life’s, every part of our society, is affected by human sin and evil. When we see the outworking of that we mourn, but we should not be surprised. Another aspect of this is when people say, but David all that you are doing here is just what you are criticising others of doing. You are creating your own ‘us’ and putting everyone else into the ‘other’. But what I believe prevents me from doing that. It’s not just that I believe, but I know, that my sin is so deep and dark that I can identify totally with the Apostle Paul when he says “I am the chief of sinners’. As I look through what I have written above, I think I can honestly say that I have been as guilty of these things as anyone else. I don’t know a greater sinner than myself – although that may be a statement of the limits of my knowledge, as much as it is a statement of the greatness of my sin. 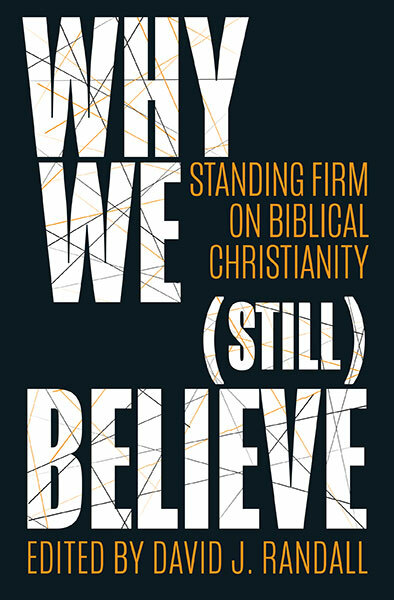 2) Humility – Total depravity means that for the Christian there is no ‘them’. There is only ‘us’. And all of ‘us’ have sinned. All of us like sheep have gone astray. Therefore we cannot look upon ourselves as the good, and the ‘other’ (whether Muslim, Fascist, Homosexual, Liberal, Conservative, Immigrant, White, Black etc.) as the bad who are the threat who are going to destroy us. An understanding of our own sinfulness is the first prerequisite for real humility – not thinking of ourselves more highly than we ought. One fruit of this is that, without being bland, we tone down the shouting, the emotional rhetoric and the self-righteousness. It also means that we have to be humble because we just don’t know. We may have access to the Internet, or years of experience, or even our own particular wisdom, but in the grand scheme of things we just don’t know. Would that our politicians were like Solomon and prayed for wisdom that they might govern this great people! 3) Sovereignty – One of the big arguments re the EU is about Sovereignty. Are the people Sovereign? The EU Commission? The UK or Scottish Parliaments? Those in power tend to think they are sovereign and yes they can fix things. With them things can only get better. When they don’t, those outwith the power structures tend to become cynical and bitter. This is surely a major source of so much of the anger in the politics of the West today. The Bible gives us a much clearer answer. There is only One who is sovereign, and that is God. All other authority, including government (of whatever sort) is derived from him. That’s why Christians don’t panic about the results of elections and referendums. Our trust is not in rulers but the Ruler, not sovereigns but the Sovereign, not lords but the Lord. 4) Love – Hatred is beaten by love. That is true. But in order for that to be more than just a soundbite, that love must have content. It cannot just be a feeling, a sentiment, a cliché, a song or a Hallmark card. It must mean something. I turn to 1 John 4: 16 “And so we know and rely on the love God has for us. God is love. Whoever lives in love lives in God, and God in them.” The more I reflect on the love of God, the more I am overwhelmed by the love of God in Christ. I have no other realistic answer. Do you? In Christ Alone my hope is found. Hatred is only beaten by the Love of Christ. Great God, let your son see in me the travail of his soul! Bring me away from my false trusts to rest in him, and him only. Let me not be so callous to his merit as not to love him, So indifferent to his blood as not to desire cleansing. Lord Jesus, Master, Redeemer, saviour, Come and take entire possession of me; this is your right by purchase. Almighty God, who through thine only begotten son Jesus Christ hast overcome death, and opened unto us the gate of everlasting life; we humbly beseech Thee, that, as by thy special grace preventing us, thou dost put into our minds good desires, so by thy continual help we may bring the same to good effect; through Jesus Christ our Lord, who lives and reigns with thee and the Holy Spirit, ever one God, world without end, Amen. We have gone through the same events here as Christians with the horrific Orlando shooting. The news media and politicians wanting to make political capital out of a tragedy. Thank you for your thoughts–very timely for us as well. It has been and always will be this way. During a personally harrowing week with world events and the consequences, I came across a reality which when said out loud shocked me into attention just as the voice of a drill sergeant shocked me to attention as a raw recruit in basic training in the Air Force. The reality – hate makes the world go round. Within you is the capacity for infinite love and joy but the lies and hatred of the world conspire to the point of you being in danger of losing your very soul. Hate sells papers, nurtures virtue signalling, lies to you, makes you feel good and superiour for a while. The fight is not to fight back. Darkness can’t push out darkness. Only light can do that. The “good fight” is to shine your light, to love when hated, to speak truth when lied to, to build up when being torn down. What force can prevail against such things? We weep with those who weep. Without being crass or clever how do we fight hatred? Outside of Christ there is no answer to the evil in every human heart our hearts. Without the trinity there is no love in humanity. Outside of Christ there is no true peace, no true reconciliation, no true justice, no true love, no true defeat of hatred: hated to death, raised in love honour and glory. We are unable to love our neighbours as ourselves until we first love God and we love Him because we know and experience that He first loved us: unable to do unto others as we would have them do unto us, unable to think of others more highly than ourselves until we know that Christ put us before Himself, that He had others do unto Him that our Father love us as He loved Him from before the world began. Truly, my hope is built on nothing less than Jesus blood ans righteousness. Interestingly, it looks like the papers have been had by the BNP. Who knew they were that smart? Thank you for bringing some perspective to this. Tom – so you seem to be saying that the ‘Britain first’ shout is a fiction introduced by warring factions of the BNP and Britain First. I’m sure that the claimed cry IS being misreported for political purposes, but by the establishment Remain group against Brexiters and the rest of us. Why would two extreme right wing groups wish to row and harm their similar raison d’etres, whilst giving an own goal to their hated enemies? It seems bizarre to suggest – as some remain campaigners have – that we should thus vote to remain in the EU if we don’t want to see the rise of the far right in Britain. The diametric opposite is the case. The far right thrive where there is a democratic deficit, where there is a sense of a loss of control and a loss of sovereignty and democracy. Indeed, the rise of an anti-democratic EU has seen the rise of the FN in France, Golden Dawn in Greece, the FPO in Austria and neonazism in Germany. If we stay in the EU, and the EU continues in the direction it is going, then we will surely see the real rise of the far right here, not just a couple of mad people. If we want to avoid that eventuality, then we need to restore faith in the democratic system, we need to restore accountability and sovereignty, and that means voting to leave the EU in seven days time. Thank you David for a powerful Christian perspective on this tragedy. The problem with social media and Internet is that it allows us to ventilate our thoughts without any filter. It allows us, if we let it, to express our self righteous judgements and anger without the restraint of personal relationship or the chance to register the impact our words have on others. The internet reaction to the recent gorilla shooting incident and alligator tragedy in the U.S. provide good examples of this. It gives a window into our souls and what we see is pretty ugly. Your posting was reasonable, until you linked it to the hateful ideology of Christianity, in whose name the Shoah was perpetrated. It cannot be denied that Hitler was the foremost Crusader in the whole of history, surpassing the barbarity and expulsions of the Middle Ages and the pogroms of 1648. Actually it can be denied…and it is. Please don’t believe everything you read on the internet…and try to avoid your prejudices overcoming your reason…have a look at this…. Christopher Hitchins rightly said on one occasion that any opinion expressed without evidence requires no evidence to dismiss it. It therefore follows that the above claim can easily be dismissed. This and claims like it do however open the opportunity for any Christian apologist in the British values of equality and freedom to freely express that foundational to the Christian faith is first loving God and second loving others as yourself without any fear of being discriminated against. How hateful are you towards Jesus Christ, who is not an “ideology.”? How do you fight your own hatred? The Leave campaign has some elements of principle and some of opportunism. But the main elements are xenophobia and lies about the economy (eg “£350M a week”). Jo Cox was a prominent and principled campaigner against xenophobia and only the day before she was murdered she and her family were counter-demonstrating against the Farage Flotilla on the Thames, one of whom retaliated by firing river water on them with a hose. The Leave Campaign suggest (and many of their supporters say so explicitly) that people who oppose them are “traitors” and they want “freedom from Britain”. Jo Cox’s murderer has made his motivations pretty clear by giving his name in court as “Death to traitors freedom for Britain”. This is one of the most sickening posts I have ever allowed on this page. I leave it because it gives an example of what I was warning about. People using the killing of this poor MP for narrow political ends. As someone who was not sure and therefore has read many many things from both sides, your caricature of the Leave campaign is a straight out lie. Yes there are xenophobic elements but it is not characteristic of the whole. It is however a major part of the Remain campaign’s Project Fear to set up this strawman. And to attribute the murder of this MP to the whole campaign is sick. You are so prejudiced that you are prepared to take the word of a mentally ill man for your own political ends. Honestly – it makes me feel physically sick. I have been observing and participating in politics in the UK for over 30 years….this weekend sees a new low…not just the murder but the cynical and sick use of it by people who see an opportunity…. against the foes of all the saints. is answer to the soul’s laments. as snatches out of death or strife. your favour lasts as long as life. and weeping tarried for the night. are futile once you’re out of sight. you lift me to a higher place. a mountain that shall not be moved.